Established by Friends of the Fort Gratiot Light and St. Clair County in 2016, this fund provides an opportunity for friends, donors, businesses and the general public to support the long-term growth and success of the historic Fort Gratiot Light Station. Support includes things such as repairs, maintenance and upgrades to buildings and grounds, permanent signage or amenities and will not include routine operational needs. 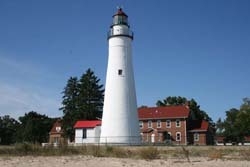 Learn more about Friends of the Fort Gratiot Light.